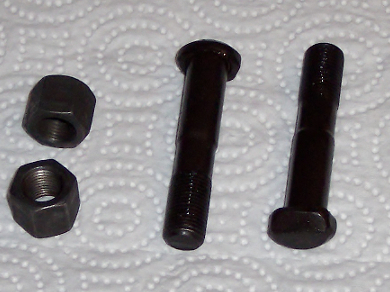 Ford connecting rods are identified by basic part number 6200. Made of forged steel, the rods used in the 428 Cobra Jet and Super Cobra Jet engines measure 6.488 inches in length from center to center. 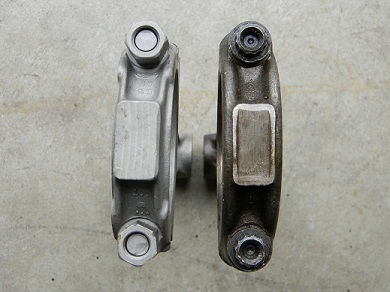 Part of the engine's reciprocating assembly, connecting rods connect the pistons to the crankshaft. 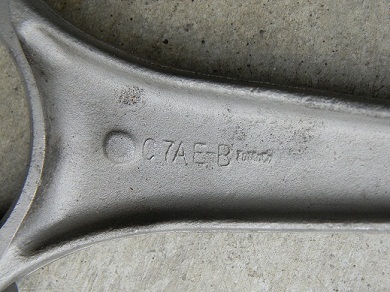 Connecting rod research seems to indicate that CJs used a variety of common high-end FE rods, with the C7AE-B rod being fairly common. We've received reports from others who claim to have found C6AE-C, C6AE-D, and C6AE-F rods in what they believe to be original engines. I've seen written reference to a C9AE-C rod also being used, but I've never been able to confirm an installation. SCJs seem to use the C6AE-E rod most frequently, though again I've seen written reference to a C9ZE-A rod that I haven't been able to confirm was ever actually factory installed. 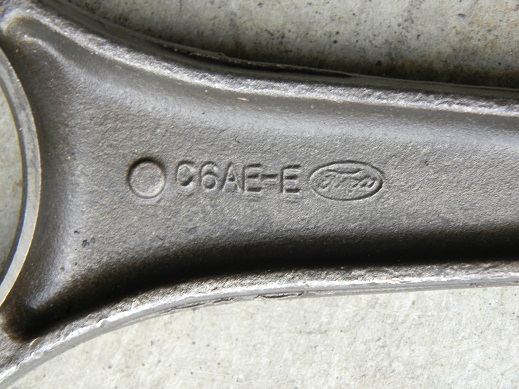 The CJ connecting rod differs from standard FE rods only in it's use of larger 13/32"-24 x 2 5/32" bolts (C2AZ-6214-B bolts with C0ME-6212-A nuts; the 390 and standard 428 use C1AZ-6214-A 3/8"-24 x 2 7/32" bolts with C1TE-6212-A (replaced by C9AZ-6212-B) nuts). 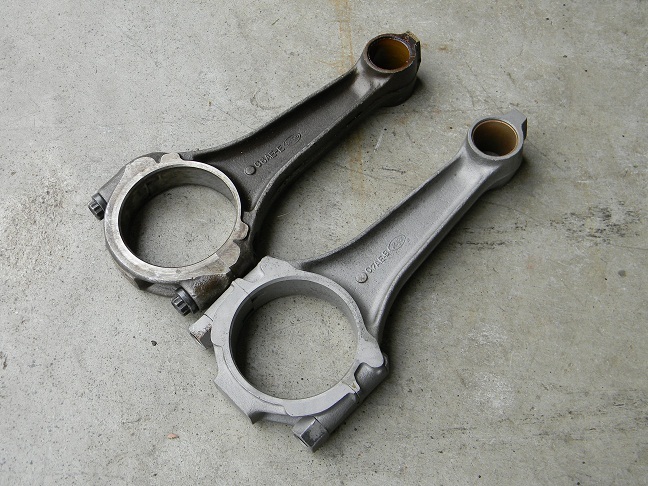 The SCJ connecting rod is a "LeMans" style rod that is about 70 grams heavier than the CJ connecting rod. 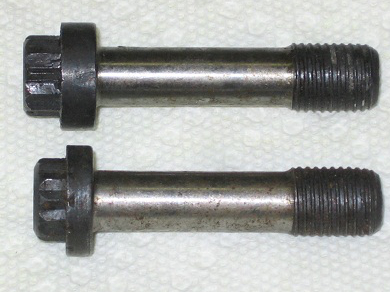 In addition to the extra material, the SCJ rod uses 7/16"-20 x 1 3/4" 12-point capscrew bolts (service part number C9ZZ-6214-A) to secure the end caps to the rod. The OEM bolts are typically replaced with stronger aftermarket fasteners from companies like ARP when assembling rods for use in high performance engine builds. 1968 - 1970 CJ C2AZ-6214-B 13/32"-24 x 2 5/32"
1969 - 1970 SCJ C9ZZ-6214-A 7/16"-20 x 1 3/4"
The earlier Ford 427 LeMans rod assembly (service part number C5AZ-6200-D) used the same C6AE-E connecting rod, but with different bolts (service part number C5AZ-6214-B). Why the difference? 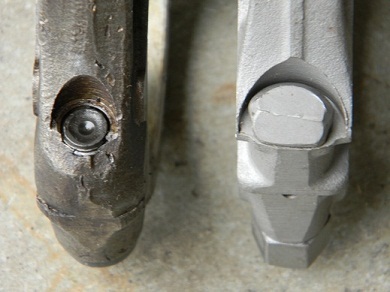 The longer stroke of the 428 (3.984" vs. 3.784") requires a slightly shorter bolt head (0.36" - 0.38" vs. 0.46" - 0.48") to avoid internal interference. 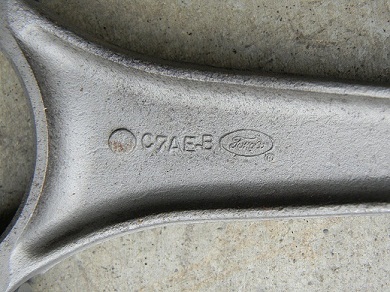 Thanks to Dale McVicker for the connecting rod pictures used on this page.